Ischia is just about ready to hibernate now that the fall is upon us. But before the island, off the coast of Naples in Italy, closes up shop for winter, let's take a look at its best eats. After all, on those cold winter nights don't you want to go to bed with visions of Italian food dancing in your head? Maybe that's just me. With its view of the ocean and Ischia's famous Aragonese Castle, this restaurant oozes romance. It's definitely the spot to hit on date night. And the ambiance isn't the only thing it has going for it. It could have just as easily been labeled the best restaurant for seafood. The julienne calamari salad, which features calamari, arugula, and cheese in a balsamic dressing, mussels au gratin, and the tubes of pasta stuffed with dentex fish in a prawn and mussel sauce are must haves. One look at the Website, and you'll realize this eatery is all about family. Run by the D'Ambra brood, you will be welcome with open arms by the staff. This is as close to home cooking as you'll get in any restaurant anywhere. You'll feel like you're in mamma's kitchen because you can see the chefs at work from the dining room, unless you're there in the warmer months and snag a post outside near the old-fashioned wine barrels. This place is a meat lovers dream, which is unique on an island where seafood often reigns supreme at restaurants Here, if you order ahead, you can feast on Ischia's signature dish, rabbit. Of course, that's only if you have room after the famous antipasto, which is a meal in and of itself. The fresh, made-from-scratch gnocchi is also top notch. And you'll be dreaming about this food for years after you leave Ischia (or maybe that's just me again). My husband actually works at this hotel, but I'd have put it on the list last year, too. Back then, he wasn't an employee but we had dined there. This restaurant offers gorgeous views of the ocean, a lovely terrace and pool area (which diners are free to walk around), and some delicious food. One of the highlights of the menu recently has been something you don't ordinarily find in Ischia � an appetizer that pays tribute to American-Chinese food. As part of a larger plate of seafood, guests get a hollow orange filled with shrimp in an orange-flavored sauce. Since the citrus fruit in Ischia is some of the juiciest and tastiest in the world, it's the perfect place for this bite. To boot, all their pasta dishes are memorable and worth a try. My husband has been taking me to this lovely little spot in full view of the Aragonese Castle for as long as we've known each other. If it's warm enough to sit outside, you can take in the scene of quaint Ischia Ponte with its cobblestone path leading to the bridge that leads to the castle. It, too, lends an air of romance. But I always thoroughly look forward to sampling mussels in a slightly spicy broth (and eating lots of grilled bread dipped into said broth), bruschetta (you can't go home without sampling Ischia's tomatoes on top of more grilled bread), and the seaweed fritters (trust me, you won't even know you're eating any seaweed). Those are just the stand-outs among the starters. The pasta dishes are sublime, and I've enjoyed many fish dishes, including a perfect swordfish that I still think about on rainy days. With the fishermen literally making their daily catches right outside the door of this restaurant, it only serves the freshest stuff. The best part? Four people can get an abundant sampling of antipasto, pasta all around, and a super-sized dish, such as the swordfish to share, for around 70 euro. Can't beat that in Ischia. One of the most memorable meals I had here was simple and it wasn't even pizza. It was fried steak and potatoes with a green salad dressed in salt, olive oil, and one of Ischia's fragrant lemons, which found its way onto my meat, too. And we had one of the freshest, sweetest pineapples I've ever eaten for dessert. 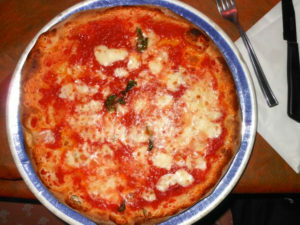 Since then, I've had pizza � classic Margherita � a dozen times, and each experience tops the previous one. That crunchy crust, sweet tomato sauce, and freshest of mozzarella is unforgettable. 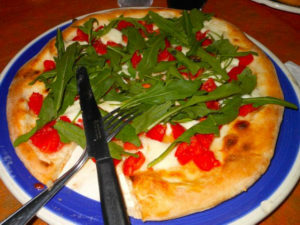 If you're not going to make it to nearby Naples to sample pizza in its birthplace, this is the next best thing. One of Ischia's popular sandwiches, the zingara, which includes lettuce and prosciutto, is on the menu but there is so much more. Hot sandwiches of roast beef, turkey, and eggplant parmigiana are all delicious. Get French fries or an American-style salad, replete with greens, chicken, corn and tomato on the side. You can grab one of these babies before heading to the beach or on the way home after a day in the sun. Di Meglio is the author of Fun with the Family New Jersey (Globe Pequot Press Travel, 2012), and you can follow her blog, Two Worlds, about life and travel in Italy and the United States.